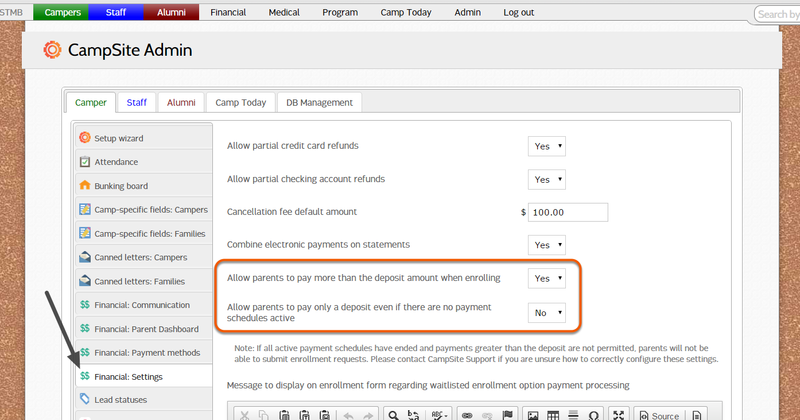 Payment Schedules make it easy to have a pre-set invoices dates that allow you to batch invoices for multiple families with just a few clicks. When a family is on a payment schedule, their balance is paid across one or more invoices, with each invoice amount being calculated by taking the family's current balance, divided by the number of invoices remaining. In the example above, the Bi-Monthly payment schedule has four payment dates. If a family enrolled prior to November 1, they would be invoiced for 25% of their balance for November 1, 33% of their remaining balance for January 1, 50% for March 1, and 100% for May 1. If they enrolled their camper after the November 1 invoice had been generated, they'd skip right to the January payment date and receive the final three invoices on the payment schedule. This behavior allows invoices to accommodate changes that may be made on a family's account throughout the year. Once the final date on a payment schedule has been reached, or the final payment date's invoices have been generated (whichever comes first), the payment schedule will no longer appear as an option on new enrollment forms. Camp can allow families to continue paying just a deposit, or require families enrolling without payment schedules to pay in full upon enrollment. The Financial: Settings section of the Admin menu contains settings which determine the payment option available to families all payment schedules are inactive. Allow parents to pay more than the deposit when enrolling allows families to enter any amount greater than the required deposit, up to the full amount due for their camper, when enrolling at any point during the year. Allow parents to pay only a deposit even if there are no payment schedules active controls whether or not families will be required to pay in full if there are no payment schedules available. Please note that in order to force families to pay in full when there are no payment schedules active, the option to allow parents to pay more than the deposit when enrolling must be set to "Yes".